So, you've got your music -- now start your own radio station. We already mentioned this software several months ago; in the meantime it has received a coveted " Best of Show" at Macworld earlier this month. Nicecast Radio works nicely on OS X Panther, allowing you to broadcast music from your Mac in realtime. Your listeners can use iTunes, QuickTime or even Winamp. Best of all, you can play your improvisations, live recordings or even the content of a Logic session, Peak or Live. Nicecast is ideal to broadcast your ongoing work from one continent to the other, from Louisville to Paris. Check it out! Nicecast Software Page (MacMusic) Post a comment ? 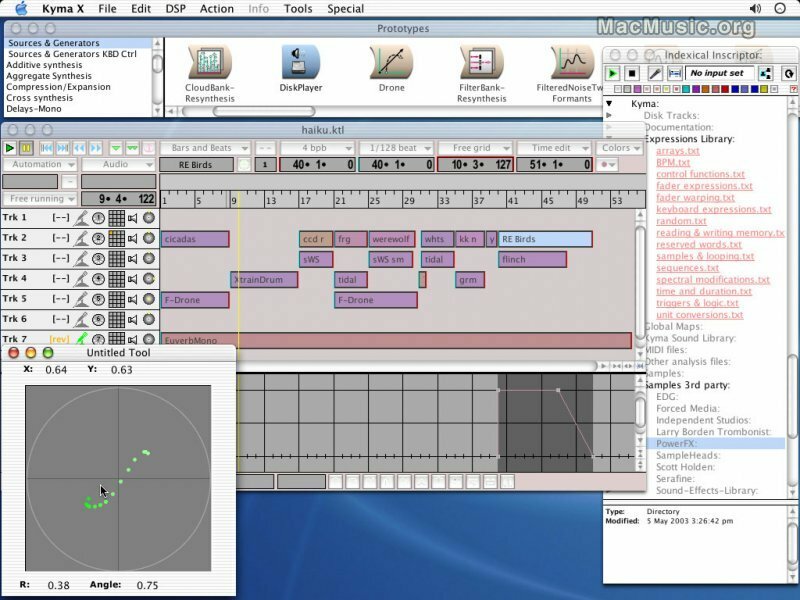 MidiPipe is freeware from Nico Wald. This utility can be useful in a music studio or on stage to modify MIDI messages in real-time. The new 0.7.4 version fixes bugs in "Keyboard" tool and optimizes MIDI message handling (lower latency). 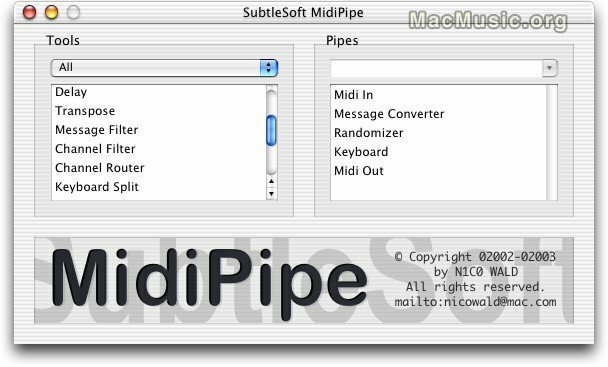 MidiPipe 0.7.4 beta is freely downloadable. MidiPipe MacMusic Page Post a comment ? SymbolicSound has announced the release of Kyma for Mac OS X, an advanced sound design environment allowing users to create their own sound design tools. This new version features a new editor, newly designed and zoomable icons, enhancements to the spectral analysis and synchronization tools and a 432 page users book. The upgrade of this unique software costs EUR 175. New users will also need the Capybara sound engine which comes bundled with Kyma X. The full bundle costs EUR 3570. Kyma X Post a comment ? The Mayhem VST plug-in suite by Audiodamage is a collection of four different effects designed to provide new tools for aggressive contemporary musical styles. 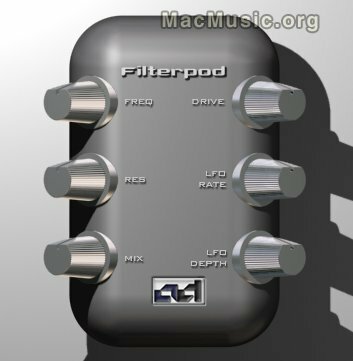 Included in this package are Filterpod (a low-pass filter with LFO), Crush (the World's Most Dangerous Compressor...), MasterDestrukto (a plug-in featuring four different distortion algorithms for massive audio manipulation), and TimeFnk (a rhythmic delay). The Mayhem VST for OSX and OS9 will be available March 04 for EUR149. Clavia Nord Modular G2 Mac Editor at last? Thanks to Russel Brower on the Modular List, we happened to learn that "Mac version is now being re-considered" (from a Clavia official at NAMM).